Traffic Data Classifier System - Wanco Inc. The Wanco Traffic Data Classifier System provides a safe method for analyzing traffic patterns. The Data Collector employs side-fire radar to measure vehicle speed and length. Completely nonintrusive, it uses no wires, loops or hoses. 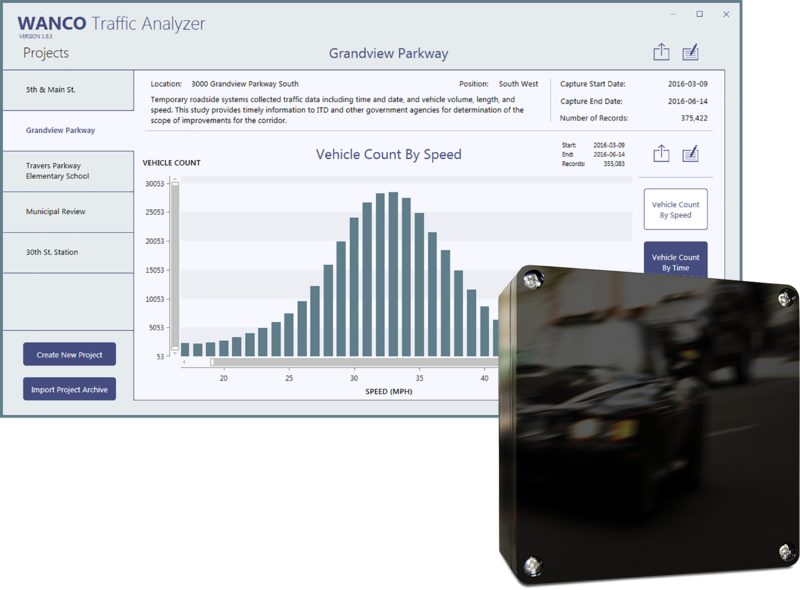 The Traffic Analyzer software is an analytic graphing application that makes it easy to chart and interpret traffic data. With an optional modem, data can be retrieved remotely via the Internet. Agencies with an interest in public safety use the Wanco Traffic Data Classifier System for analyzing traffic flow and making informed decisions for managing traffic. The system is often deployed in neighborhoods, school zones and traffic hot spots to investigate complaints from citizens, neighborhoods and construction crews. The system comprises a data collector and analytic software. The data collector is installed on a Wanco speed trailer, message sign, or nearly any Wanco equipment. The data collector employs side-fire radar to measure lane flow and density, continuously capturing vehicle speed, direction, length and count. It captures both approaching and departing traffic. It operates simultaneously with or independently from the equipment it is attached to, and is powered by that equipment’s power system. The Wanco Traffic Analyzer program, installed on a user-supplied computer, downloads traffic data from the collector and presents it in interactive graphs that are easy to customize, making interpretation a simple task. The program allows multiple projects to be managed in a single window, and data graphing can be filtered and customized. The program presents graphs for vehicle count versus speed, volume over time and means and percentiles. The data collector stores up to five million records in internal memory, data that can be retrieved for analysis. Millions of records can be downloaded locally or remotely in just minutes — locally using a USB flash drive, or remotely over a wireless cellular connection. When the system includes an optional Wanco cellular modem, the Traffic Analyzer can retrieve data remotely over an Internet connection. Not available for aftermarket or field installation.